With Earth Day around the corner, I’m excited to share this DIY paper butterfly tree that’s made from recyclable materials or items you may already have around your home. Creating beautiful home decor doesn’t have to be expensive, but sometimes requires a little imagination…and a walk around your yard! 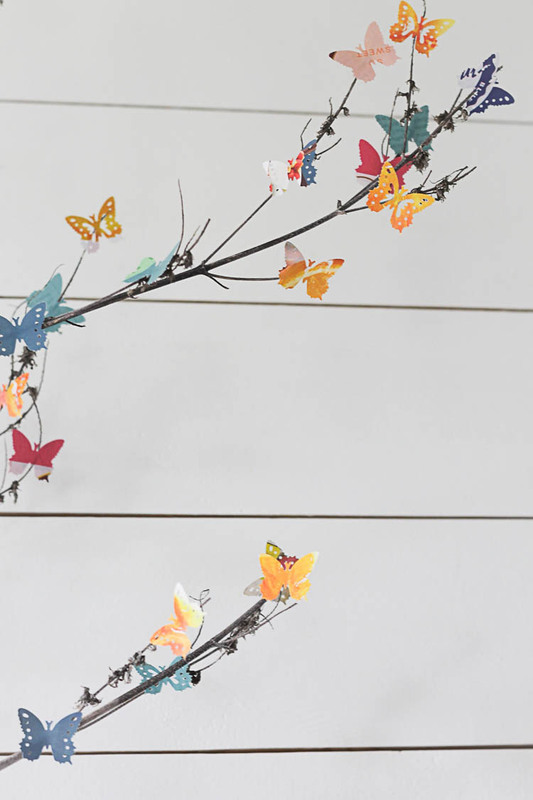 Begin your DIY paper butterfly tree by collecting recyclable paper in fun springy colors. I went through a few magazines and pulled pages with the brightest colors, but newspapers or book pages would be great too. Then, using a butterfly paper punch, punch out a bunch of little butterflies. This would be a great job for kids to get them involved in the project. This particular paper punch has three different butterfly shapes, which adds even more interest to the project. Use a hot glue gun to add the DIY paper butterfly cutouts to some sticks. The more little branches, the better! Add as many butterflies as you like…the more, the better! After a long winter, I love bringing in pops of color in my spring decor. These little butterflies add a bright and cheerful pop of color and can’t help but make you smile when you look up at them. For the tree, I used a large branch and covered it in butterflies. Then, I stuck it in a bucket filled with wadded up magazine pages to hold the tree in place. I happened to have some moss on hand, so I added it to the top of the bucket. It looks just as fun without, though. I’m loving the subtle pop of color on my otherwise neutral mantel. There are so many possibilities when it comes to creating with recyclable materials. Hopefully this project inspires you to create with Earth Day in mind! Another way you could use the DIY paper butterfly cutouts would be to decorate a spring wreath with them, just like this DIY butterfly wreath.